Many of us find the romance of the medieval knights, with their chivalry, honor, and courtly love, enchanting. Who wouldn't want to be descendants of such brave, honorable men? 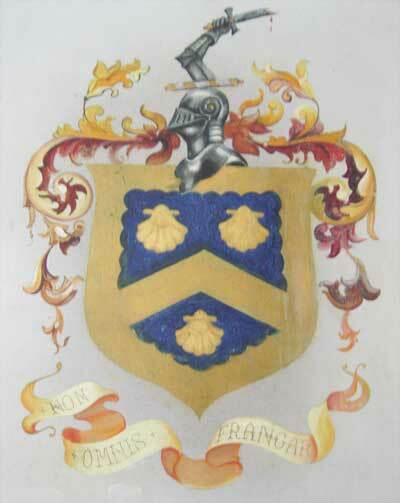 The Colby Coat of Arms is an ancient crest that was bestowed upon a valiant member of a Colby family of Great Britain. Which brings us to the point! What Colby family? I am sorry to say, it probably was not the family of Anthony Colby of Horbling, Lincolnshire, England who came to New England in 1630. We cannot connect our Lincolnshire Anthony Colby to this aristocratic line - though many have tried. The Macy-Colby House has displayed the Colby Coat of Arms since it became a museum in 1899 and shall continue to do so. While we may not be able to claim alliance to this Coat of Arms, we feel our Anthony Colby, of Horbling, England, who in 1630, made an epic journey of thousands of miles to start a new life, in a new world, had the honor and courage to match the bravest of medieval knights. The beautifully carved wooden Colby Coat of Arms on display at the Macy-Colby House correctly depicts the crest and heraldic symbols but unfortunately has the wrong motto. The Colby motto in Latin is: Non Omnis Francar, that mean, 'Shall Not Be All Broken." The carved piece instead incorrectly has Vincit Amor Patrial, which means, 'To Love My Country'. Both of these mottos are honorable aspirations any of us can try to follow.